The Spähpanzer Ru 251 is a premium Rank IV German light tank with a battle rating of 6.7. It was introduced in Update 1.67 "Assault". A very mobile light tank developed for the Bundeswehr to replace their M41 Walker Bulldogs, the Ru 251 boasts great mobility and firepower for its users. The Ru-251 has a relatively small profile for a tank, but for a light tank its profile is average. The Ru-251 utilizes a 90 mm BK-90, the same gun as on the Kanonenjagdpanzer. It is capable of firing HEAT-FS, a potent round, and has a reasonably quick reload. Best for medium range engagements, but can fulfill close range and long range applications as well. Similarly to the Leopards, it has a raised engine deck at the rear, which messes with the gun depression. 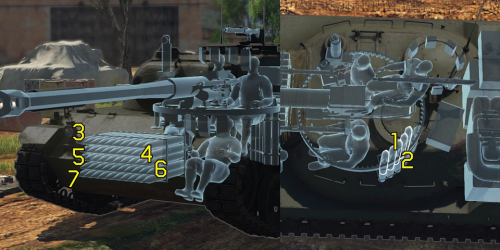 While it has 9 degrees of gun depression for about 130 degrees of turret rotation to the left or right (Gun pointing straight ahead), for the rear 100 degrees of angle, the gun depression is only a degree or two. The bigger the map (provided it has cover), the more successful the Ru-251 will be. This is because it can use its speed to reach places early in battle that the enemy would not suspect an enemy tank already occupying. The smaller the map (Even with cover), the less successful the Ru-251 will be. This is because it cannot make use of the single biggest advantage it has, speed. Essentially it will be forced into slugging matches, and the enemy will always have a pretty good idea of where the Ru-251 will be. Belly armour is 9.5 mm thick. The Ru-251 is a very quick light tank, but it is not always fast. 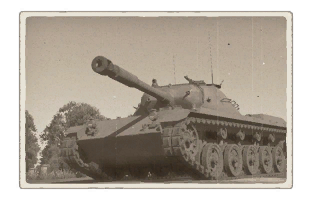 While it is true that the tank has a very high road speed, it can only make use of it in certain situations, much like the M18 Hellcat. That being said, thanks to almost 26 horsepower per ton, it can maneuver much more quickly over smooth and rough terrain than most other tanks. An important thing to remember is that just because the Ru 251 has the capability of covering large distances quickly, doesn’t mean it is advisable. This tank, like many german post-war vehicles, has virtually no armour, and a huge ammo rack located in the front of the hull. This tank is highly effective in ambushes, and sniping from cover and the sides of maps. As mentioned prior, this vehicle is not being played to its fullest extent when the enemy knows where it is, or in slugging matches. 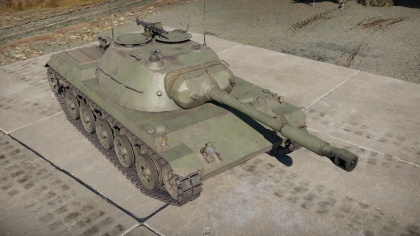 Because the Ru-251 enjoys a gun similar to the M47 Patton and Jagdpanzer 4-5 that utilizes HEAT-FS, HESH, and HE, which are extremely potent at 6.7. There are virtually no enemies that can withstand the power of the HEAT-FS, even if it only penetrates 320mm of armour compared to later HEAT-FS that can penetrate 380 mm of armour or even more. It should be noted that thanks to the transmission in the Ru-251, it can travel as fast forward as it can backwards. As many German tanks have poor reversing speed, this is a welcome change. Another wonderful feature of the transmission is the neutral steer. Unlike other tanks that are sluggish in their neutral-steering abilities, the Ru-251 will turn quickly when the input is made (Unlike the M41, which feels sluggish when neutral-turning, and at times feels hesitant). Even though the Ru-251 is a light tank, it utilizes advanced HEAT-FS that allows it to penetrate even the most challenging of opponents, such as the Maus. Upon contact with ammo racks and fuel tanks, serious damage will be done, if it does not outright destroy the opponent. Before all, avoid colorful or bright decals. Camouflage is an essential part of defense. The characteristics for good performance in battle are: be "invisible", fast and effective. The Ru 251 speed is its best ally. This speed has to be used for flanking maneuvers and relocate. Not for trying to cross open field. That`s a poor tactic. Relocate: The Ru 251 will have to do this movement again and again. Choose a good spot wisely, if trees needed to be cleared for visibility, use the machine gun in short bursts. Remember, tracers can easily reveal anyone's position. When in a shooting spot, use the gun depression and keep the hull down until a target is found. Once a target is acquired, aim at critical components by firing into the fuel tanks or the ammo storage. If the shot misses, but are sure the enemy hasn't discovered where it came from, try another shot. Keep in mind, even if the target is oblivious, other members of the enemy team may have seen the firing location, so be careful. If detected, hide immediately! Relocation after being spotted is always advisable, but if relocation is not possible, wait until the enemy has become preoccupied with other team members. Flanking: Flanking is the most dangerous maneuver of all because at times the Ru 251 has to expose itself to get to the enemy's rear but it’s very effective when orchestrated properly. Early on in the battle, often enemy units are preoccupied with trying to get to their positions that they might not notice someone flanking, depending on the map and route taken. If a flank is attempted later on, be sure that all enemy vehicles are focused away from, or cannot see the path that is used to flank. When flanking, attacking lone targets will yield the best results. If firing carelessly into a group of tanks, they will locate the flank position and likely highlight the Ru 251 for the entire team to see. On the other hand, if targeting a lone tank, they typically do not tell their teams where they were shot from, and this gives some degree of protection. If they happen to spawn again, be sure to watch likely avenues of approach from the closest spawn and listen for aircraft, as they likely are trying to get vengeance. Avoid flat terrain: Flat terrain means that the Ru-251 will become an easy target for virtually any vehicle by exposure, especially when not moving or when moving in a straight line. Open plains are the bane of the Ru-251. Whenever possible, one should try to stay amongst hills or within buildings. As with all premium vehicles, the Ru-251 is fully upgraded, and comes with a talisman. Is very, very quick, and has great maneuverability. Utilizes a very similar gun to the one found on the M47, however is at BR 6.7, not 7.3. Has (likely) the fastest reverse speed in the game. Reload (With full crew + Expert training) is very quick for the caliber and potency of gun. Little armour (Advantageous for BR 7.0+ battles, where mobility is favored). While acceleration is quick, it is not necessarily fast. Little armour (Disadvantageous for BR 6.3- battles, where more armour can lead to bouncing). Has very poor top armour, extremely vulnerable to artillery.